If you’ve known me for any amount of time, you’ve probably heard me mention that Cardcaptor Sakura is my favorite anime series of all time. So with Nakayoshi’s (the magazine that originally published the manga) 60th anniversary, and the 20th anniversary of the manga itself coming in 2016, various companies have been rolling out new or reproduced Cardcaptor Sakura merch. To which I respond hell to the yeah. Recently I got my sticky mitts on the S.H. Figuarts version and will tell you what I think. First off, the box is freaking gorgeous. Not only do you get this gorgeous plastic slip cover with Sakura and some cherry blossom petals floating around three of the sides with details of the figure on the back, when you slip it off the artwork mimics the Clow Book and opening the front lets you preview the figure itself. These totally unnecessary but clever design choices really make me love packaging design. As for the figure itself it comes with quite a few really neat goodies. You have the standard multiple faces and hands for various expressions and poses. The faces are nice and easy to swap out but that hands can be a little difficult. I wish Bandai would standardize how to fit their hands because they have like three different methods with some working much better than others. The figure itself is really lovely and thankfully, unlike some fiascoes in the past, she isn’t falling apart at the joints or stuck anywhere. Her sealing wand goes smoothly in her hand and is just as nicely sculpted as the rest of the figure. She also comes with a blank Clow Card, but I sorta hate the slit in it. It doesn’t fit perfectly in her hand so it creates a noticeable gap. As insane as Mars’ ofuda was in the Sailor Mars Figuarts, the final result was a lot nicer. Sculpting it to the hand would have been good too. Of course, where would Sakura be without her gluttonous, vain sidekick Kero-chan? Kero is super cute and his head is poseable, but his tail is rather a pain in the rear (oh ho! Clever play on words!) It doesn’t stick very well and falls out all the time. So make sure you don’t lose it. I wish it was sculpted or glued on instead so it wouldn’t be such a headache. The other downside is that unlike the Figma or Nendoroid, Kero doesn’t have his own stand so you can’t pose him mid air. Best you can do is set him on the base, which is sort of lame considering all the other detail and thought that was otherwise put into the design of this sculpt. I’ve reviewed Bandai’s Sailor Moon Figuarts before with mixed thoughts. They tend to be beautiful figures with great details, but they tend to have manufacturing issues that can be super irritating for a toy your pay for as much as a video game. 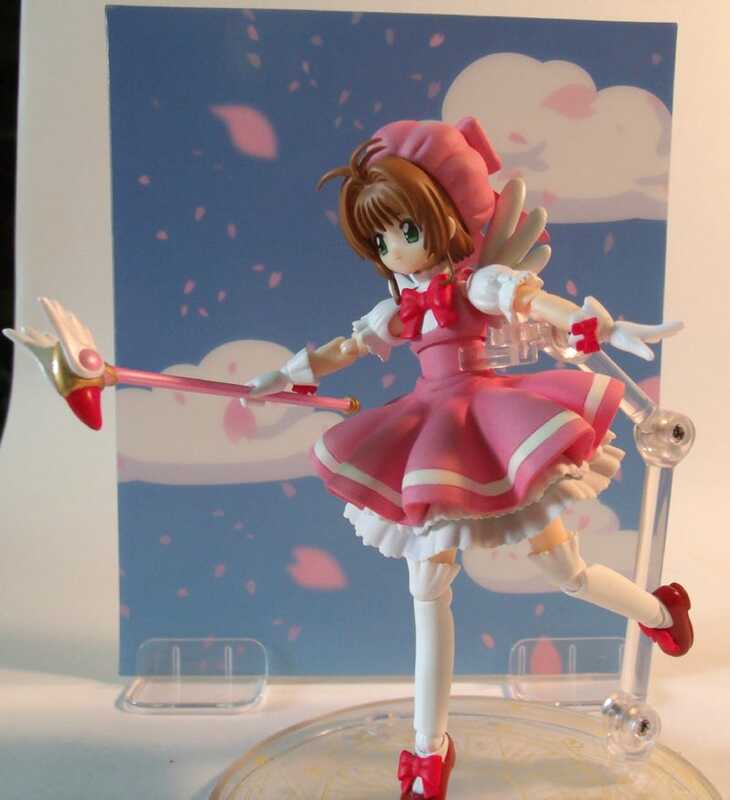 The issues with the Sakura figure are fairly minor and aside from Kero with his lack of stand and tail problems I wouldn’t consider anything a deal breaker, especially if you’re a Cardcaptor Sakura nut like I am. The best part is the price. For whatever reason, the figure from Amazon hovers around the 15 dollar mark, making it one of the best deals for figures on the site.